Today, Soubry is being run by the third generation of the same family. The company has 3 production sites, 80 production and packaging lines and employs around 400 people. Together they continuously turn flour, water, and eggs into pasta. Soubry has its own pasta brand, but also produces pasta for private labels. As such, they are the market leader in Belgium. The private labels do, however, put a lot of pressure on their production process. 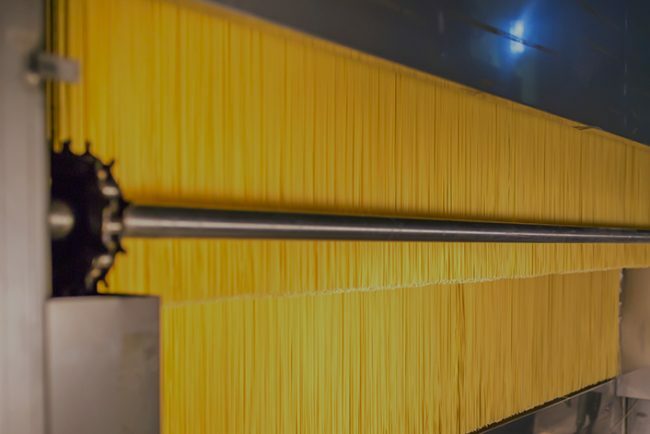 Pasta is made in a mixer, pushed through an extruder and dried in an industrial oven – complete with different temperature zones. If maintenance is needed while the oven is operative, it causes huge losses, since the cool-down and start-up time are quite long. In this sense, time is money and unplanned downtime to be avoided at all costs. A few years ago, Soubry was looking for a partner to help them increase production efficiency by providing live insight into the production operations in all 3 sites. Connecting the plantfloor with ERP (SAP) was imperative for the vision and requirements from Soubry for the MES platform. The integration of real-time plantfloor data to SAP provides Soubry with accurate and up to date information for more efficient decisions regarding production planning, resource management, and supply chain. As a result, Soubry can now monitor production, measure downtime, streamline its supply chain and maximize overall production efficiency. In the end, this evolution also benefits the end-customers, since Soubry can now offer more competitive prices and more reliable deliveries. Before INDEFF arrived, Soubry already had quite a few active PLCs, but they weren’t connected to an overarching MES-system. Additionally, the PLC controls were part of machinery from different manufacturers and stemmed different time periods. The result? A series of complex black boxes and fragmented information. INDEFF solved this issue by installing new sensors and connecting them to a single data collection PLC per production facility. Then, our engineers installed the Wonderware MES platform to connect the PLCs and created a visual interface and dashboard of Soubry’s production lines. The dashboard now shows the live state of Soubry’s production and packaging lines on tablets and on the desks of management.